I Americanized this recipe by adding vanilla to the topping and some spices to the apples. Vanilla extract doesn’t seem to be a thing in Europe. Everywhere I go, I find vanilla sugar. And most brands aren’t even real vanilla sugar but use synthetic vanilla flavoring! Yuck. Luckily, it’s really easy to make homemade vanilla, so that’s what I use. Most Swedish fruit pies I’ve had didn’t have any spice but because I’m me, I added cinnamon and cardamom. Scandinavians love their cardamom and so do I! It just belongs in this pie. 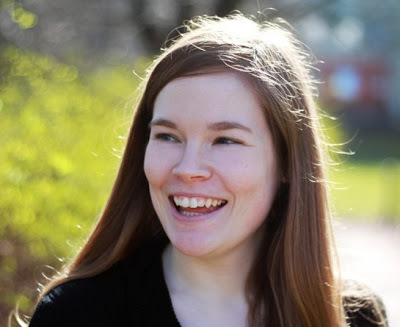 I’ve mentioned this before, but I was an exchange student twice in Sweden and have gone back for lots of visits during the summer. This has resulted in me eating lots of Swedish pies. And lots of Swedish pancakes, kladdkaka (which is like a dense and fudgy brownie cake! ), and pepparkakor (which are thin, crisp ginger cookies popular around Christmas!). The type of pie here is called a smulpaj, or crumb pie and is almost like a crumble or crisp. I wanted to make today’s Swedish apple pie gluten-free, so I replaced all-purpose flour with oat flour, and although the texture is a little different, it’s no less delicious! 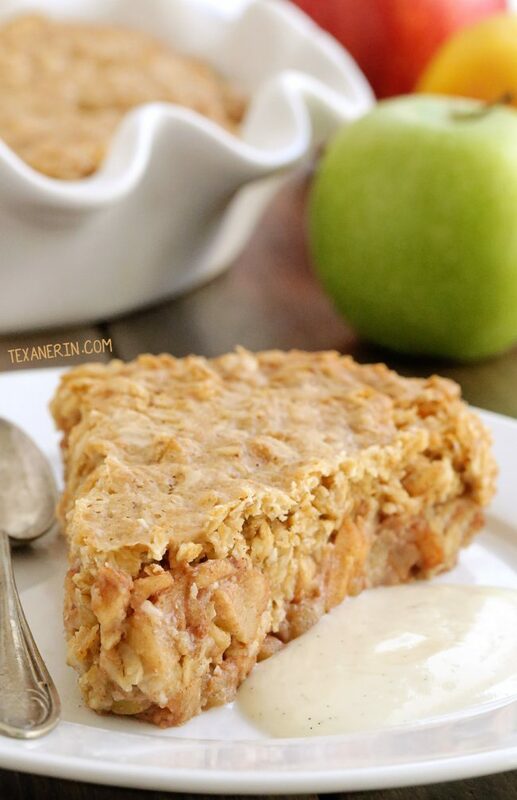 For something more traditional, try this classic apple pie from That Skinny Chick Can Bake! Instead of ice cream, Swedish fruit pies are usually topped with vanilla sauce (that usually comes from a box, I might add!) I included a recipe for vanilla sauce in the book that uses egg yolks and cream but because I was feeling too lazy to divide eggs and I wanted the sauce to be dairy-free, I’m sharing a different version here. This one is easier and uses a whole egg and milk rather than cream. For a vegan alternative, use my paleo vegan vanilla sauce! I’m not including the recipe here because it’s not as straightforward as the egg version. It’s super easy but I think the post should be read before making the sauce as it includes a lot of tips and answers to substitution questions I’m anticipating. 9/21/2016 update for the people coming in from Pinterest – I have no control over what ingredients Pinterest shows in their pins. I’ve linked to a vegan alternative for the vanilla sauce since the very first day I posted this pie recipe – both in the post and in the actual recipe. The pie is indeed vegan and does not contain milk or eggs. Preheat the oven to 350 °F (175 °C) and grease a 9" pie pan. In a large mixing bowl, stir together the apple chunks, cinnamon, cardamom and sugar. In another large mixing bowl, stir together the melted coconut oil, sugar, maple syrup and vanilla extract. Add the oats, oat flour, baking powder and salt and stir just until combined. Spread the apples evenly over the bottom of the prepared pie pan. Spread the topping over the apples. Bake for 40-45 minutes or until the apples are bubbly and the topping is firm. Cover and store at room temperature for up to 2 days. Refrigerate after that. This is the recipe for the non-vegan vanilla sauce. In a medium saucepan over medium heat, stir together the milk, sugar, cornstarch and salt. Whisk in the egg. Slice the vanilla bean open and scrape out the seeds. Add them to the pan along with the scraped-out bean. Bring to an almost simmer while stirring constantly. It should thicken quite a bit and coat the back of a spoon. It's okay if it simmers briefly, but do not let it boil. It'll likely take 5-10 minutes. If using vanilla extract instead of a vanilla bean, add it now. It will continue to thicken a little as it cools. Remove the vanilla bean before serving. Once cooled, refrigerate in an airtight container for up to 3 days. 105 comments on “Swedish Apple Pie (gluten-free, vegan, whole grain, dairy-free)” — Add one! The pie looks delicious! I love that vanilla cream on top too! I’m no fan of apples, but apple pies, yes ma’am! I haven’t tried Swedish apple pie before, but I will soon thank you to your recipe. I’m glad to hear that! I hope you’ll love it as much as I do! This is to me the first gluten free and dairy free dessert that is sooooo delicious! Thanks for sharing this ! Can’t wait to try other recipes! Hi there! You’re welcome. :) I’m happy that you finally had a successful GF / DF treat. I have loads more and hope that you’ll enjoy them just as much. Thanks for your comment! It looks delicious, but I can’t use oats. 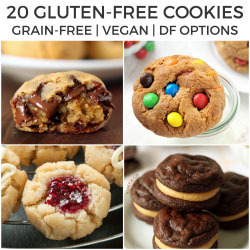 Is there a gf flour substitute? Hi there! I’m sorry for just now seeing your question. Unfortunately there’s not a good sub for oat flour (I’ve tried several). Sorry about that! TexanErin does it again! I served it, about 20 minutes out of the oven (we couldn’t wait) with a coconut milk almond sauce and non-dairy whip. My husband said: “that one is a keeper!” I even replaced the granulated sugar with 1/4 c monk fruit sugar and 1/4 c Eryithol. I used coconut sugar in the apples and glycerite stevia in the sauce. So yummy, homey, and palate pleasing. Nothing but happiness here!! Oooh! Thanks for sharing your lower-carb version. :) What a great tip! I’m really happy that you enjoyed it. Thanks a bunch for your comment! Aww, yay! I’m so very happy that you and your friends enjoyed the pie. I hope that your family will like it just as much! And I hope that you’ll love the other recipes. :) Thanks for your comment! I’m wondering if I can make this a day before we plan to eat it? I’m assuming it would be fine in the fridge overnight? What about the vanilla sauce? Everyone is so excited to try this! This pie is delicious!! I can’t eat gluten or dairy, but everyone else in my family has no restrictions. This recipe got a big thumbs up from everyone! My husband can’t have coconut oil. Will the taste change too much if I use canola or olive oil? And probably leave sauce off too. Poor guys diet is restricted. Sorry for the slow reply! Have been in the hospital giving birth. :) Don’t think it’ll change the taste but it may affect the texture a little since coconut oil is solid at room temp and those oils aren’t. Butter would work if he can have that! My pie is in the oven now! Can I use ener-g egg replacer or another egg alternative for the topping sauce? The vegan version has nuts in it and my kid is allergic to nuts, eggs, dairy! Side note, they enjoyed making the pie and “tasting it” before baking it!! I’m Norwegian and remember my grandma making this. Tomorrow is a trip to the farm stand for apples. Thanx so much. Great recipe, Erin! I made this for my office’s Apple Bake-off, and it won Audience Favorite! I used the vegan version of the sauce, and everyone was RAVING about it. Thanks for this wonderful vegan recipe – I’ll be keeping it in my recipe box for a long time. Oh, wow! This comment made my week. I don’t think anyone has ever told me about one of my recipes winning a bake-off. How fun! :) And that’s awesome that people enjoyed vegan sauce, too! Thanks a bunch for your nice comment. Loved this recipe. We cut sugar in half and was still phenomenal! Wow, that’s awesome! So happy it came out well with just half the sugar. :) Thanks for your feedback! Woohoo! So happy to hear that. Thanks for your comment! This is amazing! My husband, who has no dietary restrictions, has declared this his new favorite!! And I’m so thankful to have a new, delicious recipe for my son who has multiple food allergies. He loved it. Thank you! I’ll be making this again and again. Hi! This looks so yummy! Question about the sauce. Is it supposed to be served warm or cold? Thanks! Hi! Thanks. :) Either works! I prefer chilled. This looks amazing! I’m a Swede in Australia and I loove my smulpaj. I will definitely give this vegan version a go! Perfect for raw food and sugar free desserts! I hope you’ll enjoy the pie! Thanks for the tip on ground vanilla powder. :) We also now have that in Germany! Still having issues with the extract but doesn’t matter since I make it myself. I actually have about 5 liters sitting around. :D Thanks for your comment and sorry for the slow reply! I’m in the process of moving and haven’t had internet since Sunday. O-M-G it is absolutely perfect, thank you so much for this amazing recipe! This looks delicious. I was wondering if it was possible to make this recipe with pears instead of apples? Thanks! I’ve never actually baked with pears so I’m not sure how they’d hold up. They’re a lot juicier than apples, right? That’s what would worry me. Sorry I don’t have a better answer for you! I plan on baking this tomorrow for my mom’s birthday! I’m curious what kind of apples you chose to use? I believe I used whatever I had laying around but I’d recommend a mix of Granny Smith and something sweeter! Here’s a great list of apples good for baking. I hope your mother has a great birthday. I’d love to hear how the pie comes out! Vanilla is most definitely a thing in Europe and the ‘real’ thing is readily available in all supermarkets. I live in the Czech Republic and I have to agree with Erin :) And I thought it was a Czech thing! Can you use another flour besides oat flour. If so which type? I’ve only tried this with oat flour, sorry! Do you have oats? You can just process them in a food processor / coffee grinder until they’re powdery! Looks great! However, the recipe uses milk and egg. The milk could be non-dairy, which would make it non-dairy. It also uses an egg. Eggs are not vegan. You should not have it stated in your posting of the recipe that it is vegan. It is misleading. There is nothing naturally vegan in this recipe if you use regular milk and an egg. Please correct that misleading information in your post. Thanks! Could I make an extra one and freeze it? Hmm. I don’t think it’d freeze very well (but I could be wrong!). Did you get that Swedish coffee cake recipe from Katerina @diethood? I would really like to try it also. I’m confused. The vegan alternative also includes one large egg. I was under the impression the vegan means no animal products. Like eggs…or milk or cream. Maybe a better title for this post would be WITH vegan alternative recipe (that isn’t really vegan) having a large picture of the pie with vegan written on it is extremely misleading when it’s just a vegan alternative. There’s no egg in the vegan alternative. You see where it says, “Use this as a vegan alternative”? You have to click on “this” to bring you to the vegan alternative. The vanilla sauce, which contains the egg, was just something extra I threw in because people asked for the recipe. The pie itself (the post is titled Swedish Apple Pie and not Swedish Apple Pie with Vanilla Sauce) is indeed vegan. I could not find cardamom in the store! Will it taste very different without it? Accidentally used almond extract for the topping instead of vanilla because I hadn’t quite had my coffee yet and it was amazing!! I recommend trying this version too!! I’ve never made a apple pie since going grain free. I bought so many apples, and my son Joe asked me to make a apple pie for tonite. I’ve look at so many but this one really caught my eye, so much that I’m not gonna make it, not until tomorrow anyway. I really want to give this pie a whole day to make sure it comes out right. I’ve read the comments and everyone is so nice and so friendly, I just wanted to say hi, and can’t wait to try this, and I’ll keep you guys posted on how it came out, my son is gonna love that sauce. He works out so much and eats clean most of the time, he really deserves this pie, heck we all do! Thanks, take care! Erin, I am totally making this tomorrow for Thanksgiving. Wondering though, since I don’t have to make it dairy free, do you think it would be fine with butter? I’m honored that you want to make this for Thanksgiving. :) Coconut oil is 100% fat and butter is 80% so in certain types of recipes, you have to use a little less coconut oil than butter. I’m guessing you’d need 9.5 tablespoons of butter but it’s just a guess. I hope you’ll enjoy it! This recipe is mislabeled as vegan, since it contains egg. You are so right! It’s vanilla sugar everything in Germany. Also, the fake vanilla is horrendous, I absolutely agree! Well, this Swedish apple pie takes the cake (gettit?!) – My mom is visiting and looking for stuff to bake so guess what I’ll be having tomorrow as dessert :)) thanks for another awesome recipe!! Haha. Good one! :D How long has your mom been visiting?! It feels like it’s been such a long time! I really wish I lived near you. I would be over every single Monday. Apples all the live long day. I make my own extracts too. Just so much fun to make, and then you know what’s in them. Always a good thing. Yay for apple season!!!! This looks amazing, I might give a whirl this weekend along with vanilla bean ice cream. Ooooh ohh! I have heard of swedish apple pie… this looks WONDERFUL! I’m so surprised that vanilla isn’t use often in European baking! Who knew?! 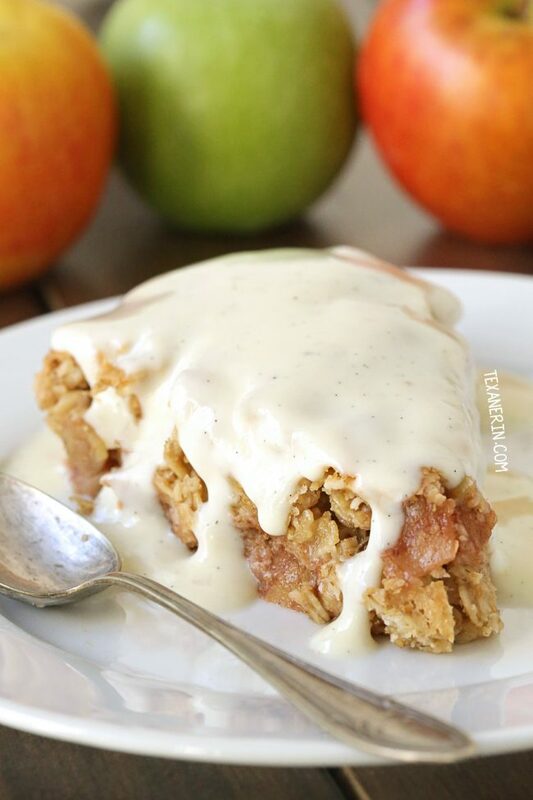 Once again, you’ve made one stunning apple dessert. I need to make this for my husband. This Swedish pie looks absolutely delicious and that vanilla sauce really tops it off nicely. I love cardamom too, so that’s a really nice touch with apples. How wonderful you were an exchange student in Sweden and have spent time there. I love Swedish sweets and this is getting added to my list of must-bake!! That vanilla sauce looks fantastic! I love cardamom too, it’s awesome in cranberry sauce at the holidays! This cake looks like something I need to make ASAP! I’ve never tried it in cranberry sauce. I’ll have to try that! I have GOT to try this!! Love the flavors. This looks like perfection! Holy moly….I am drooling over here. Thank goodness because you just made my Monday! That sauce, that cake, everything about it has my name on it! That looks so much better than so many apple cakes I’ve seen around, more dense and lots of apples. But that vanilla sauce looks even better, i’d use that to top on pretty much everything! I love autumn time! This automatically makes me think of all kind of different “wintery” spices I can use in recipes. Love how you have combined them with apples! These pictures have me drooling! Looks super delicious! Love the spices that you added and that you made it your own! I have never made Swedish apple pie but it looks too good not to try! That sauce looks amazing topped over all that apple yumminess! Looks lovely! I love that vanilla sauce!